The interior of St Mark’s Basilica in Venice is ornately decorated with mosaics. Described as a ‘marble carpet’, the floor features colourful geometric designs, and animal and human motifs. The frontispiece to this volume, which details the life of Saint Mark and a description of the Church, reads: ‘Pavimento Della Basilica Di S. Marco’ (‘Floor of St Mark’s Basilica). Despite being in the right place, to the left of the title page, this frontispiece was most probably not part of the original publication; its sheet size is different from the rest of the book. The volume has been rebound and the image has been added by the binder. This sort of human intervention offers another example of why it is so hard to determine the exact date of when frontispieces began to appear on the left. 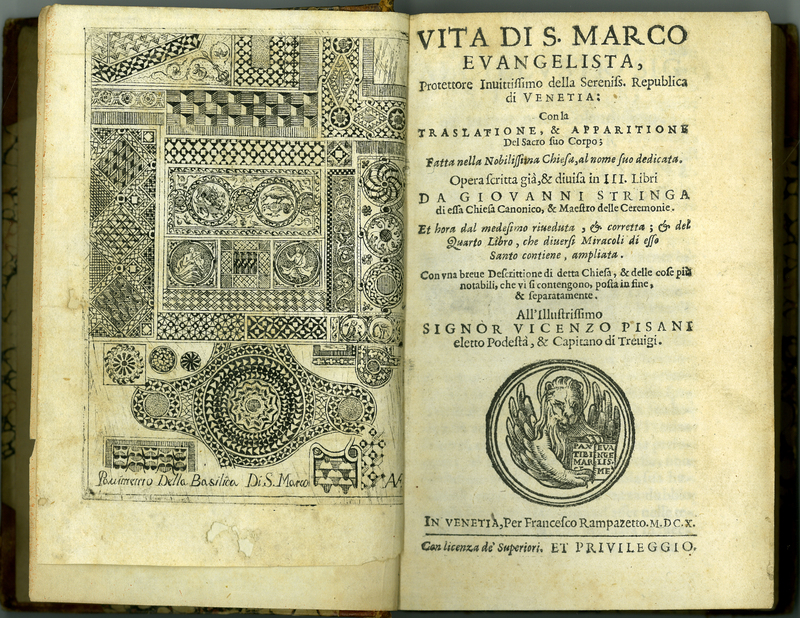 Giovanni Stringa, “Vita di S. Marco Evangelista,” ourheritage.ac.nz | OUR Heritage, accessed April 26, 2019, http://ourheritage.ac.nz/items/show/10666.